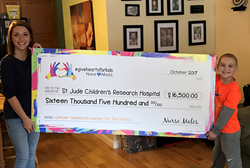 Nurse Mates, a leader in healthcare professional footwear, accessories and apparel, devoted the month of September to raising funds and awareness for Children’s Cancer Research with 100% of the proceeds directly benefiting St. Jude Children’s Research Hospital. Nurse Mates is pleased to announce the second annual #GiveHeartsForKids campaign proceeds far exceeded the 2016 campaign’s final contribution, resulting in a total donation of $16,500 USD. This year, Nurse Mates called upon the support of TV Host, and two-time NY Times Best Selling Author, Maria Menounos as well as Courtney Thibeault, the face behind nursing humor Instagram account @NursesOfInstagram, to spread the word about the brand’s campaign in support of Childhood Cancer Awareness Month. Maria and Courtney’s respective followers joined the Nurse Mates community in the effort to raise awareness and funds for Childhood Cancer Research. By simply featuring a heart photo on Instagram, #GiveHeartsForKids allowed the community to support an incredible cause and make a difference. Nurse Mates committed to donating $1.00 for every image featuring a heart posted to Instagram using the hashtag #GiveHeartsForKids and $10.00 for every footwear purchase made through NurseMates.com, directly to St. Jude Children’s Research Hospital. “We are very proud to be able to contribute to Childhood Cancer Awareness Month with our #GiveHeartsForKids campaign for a second year in a row. This campaign continues to build momentum, and we view it as a huge success that we were able to significantly increase our donation amount this year. We are devoted to this vital cause and look forward to supporting St. Jude for years to come.” David Issler, President of Nurse Mates. For over 55 years, Nurse Mates has been dedicated to providing high quality and dependable, yet fashionable and innovative products for the health care profession. Our premium full-grain leathers, slip-resistant bottoms and comfort technologies make Nurse Mates footwear the best choice for working professionals seeking long lasting style and comfort. Nurse Mates is always at the forefront of what busy professionals need - designing durable and comfortable workday products with a sense of purpose and creative flair.